I received a B.S. Degree in Special Education (Learning Disabilities and Emotional Conflicts) from Troy University in 1994 and later went back to school and earned Masters Degree in Special Education from Alabama State University in 2004. I have taught in the Alabama public school system 19 years. One year at Brewbaker Middle School in Montgomery, 10 years in Dale County at Ariton High School, 8 years in Pike County at Goshen Elementary School and 2 years at Goshen High School. My name is Amy Warrick and I am a PE teacher at Goshen High School. 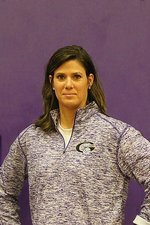 I also am an volleyball and softball coach at Goshen High School. A few quick facts about me...I was born and have lived most of my life in pike county. I am married to Jeffrey Warrick and we have four beautiful children( Alli, Fran, Kate, and Jeff). All of my children attend or attended school in Goshen. As a family we are very involved in Goshen Schools and work hard to make sure they continue to improve. Go Eagles!! !